This post does include referral links but was not sponsored in any way. This is my own opinion and own usage of the products. As we approach the Back to School time for most of us, one of the challenges that I know I have faced in the past is keeping track of everything going on each week. Now that I have two kids that are in school and involved in extracurricular activities like Girl Scouts, Boy Scouts, and Sports, keeping up with where everyone needs to be each night as well as homework and other household needs can be a challenge. Then add on my schedule and work items and it can be a nightmare! Towards the end of the school year last year, I discovered a system that works great in our household. I wanted to share it with you in hopes that it might give you some ideas on how to organize your families activities, school work, meals, and even chores like take out the recycle! I have to admit, I have used planners before including free printable ones, and nothing ever seemed to work and I would give up after a few weeks of trying. It just wasn’t “me”. I tried using Google Calendar and really, I don’t have a way to always be around the Internet so an online application just wasn’t working for me either. Truthfully, I’m a pen and paper kinda gal. 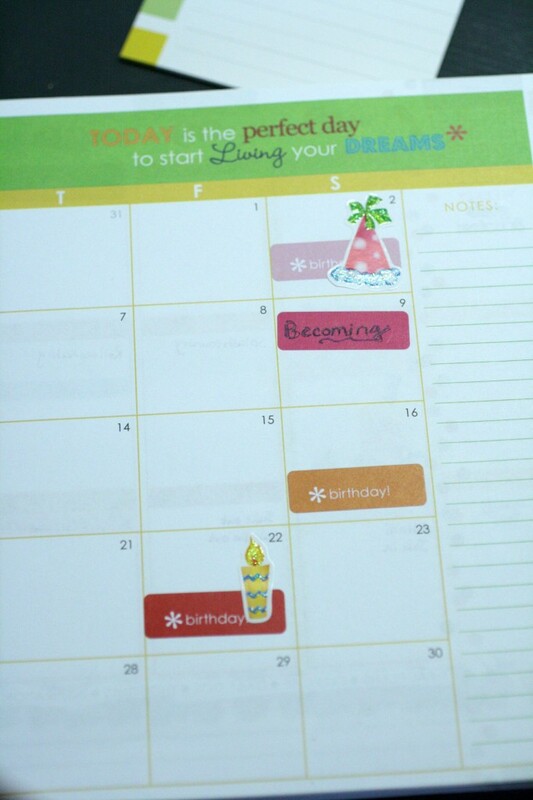 I discovered the Erin Condren Life Planner earlier this year and after reading about it, searching out reviews, and even watching YouTube videos, it looked like something that would work for me. You can completely customize the cover to fit your personality, including what you want displayed as far as writing. Some use their Family Name, some put an inspirational quote, for me, I was simple and went with my name. Each month, you have a two spread monthly overview and then after that, each week has two pages with the days of the week. Each day is broken down into “morning”, “day”, and “night”. For me, the category breakdowns we not going to work. I wanted to track my personal appointments/tasks, the family schedule, and my business schedule for the day all in one place. 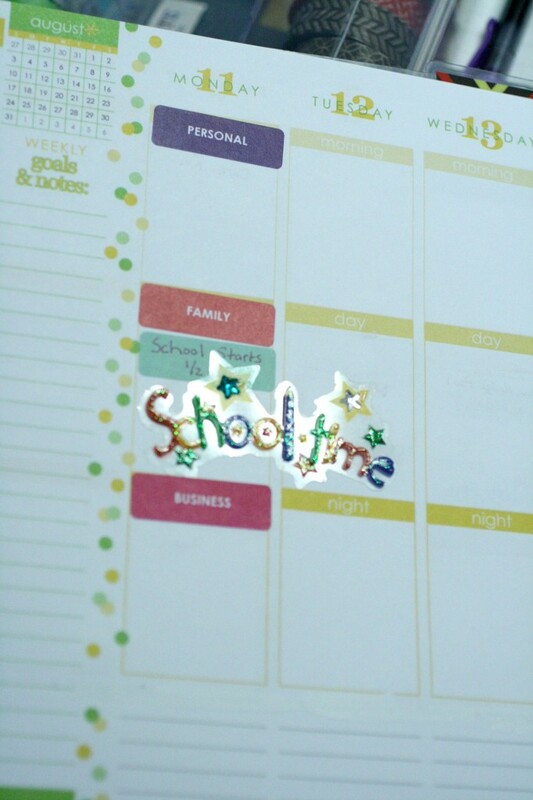 This was easily changed with the use of stickers that are included with the Life Planner. Some like to decorate each week and month with a theme and use accessories similar to what you would use in scrapbooking – washi tape, stickers, boxes, flags, etc. When I first started out, I simply would write down things and didn’t decorate much. However, lately I have really gotten in to it. It gives me a few minutes each week to be creative when looking at our schedule and planning things out. 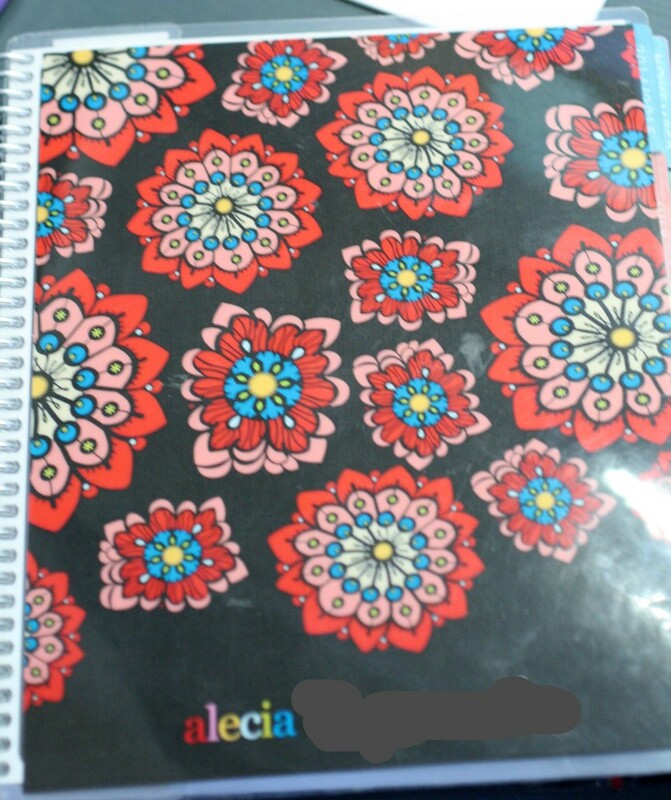 It helps me to use the planner because it is FUN! 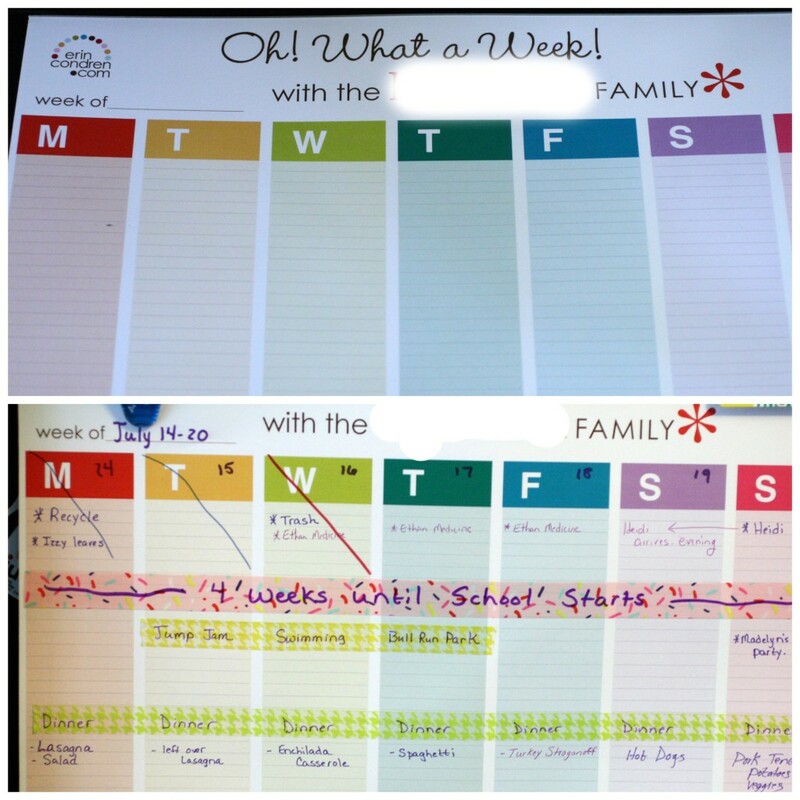 Having the planner has been a lifesaver for me, but the family still doesn’t get an idea of what is going on each week so I use the “Weekly Schedule Pad” and place it on the refrigerator for all to see! I had it customized to include our family name and each Sunday, I go through and write down what is coming up for the week for the kids, household items like recycle which takes place every other week, and on the bottom I include the menu for the week so everyone knows the answer to “What’s for dinner Mom?”. I lightly decorate mine to make it fun, but you can use it however you wish. No pressure to be decorative – make it work for you! 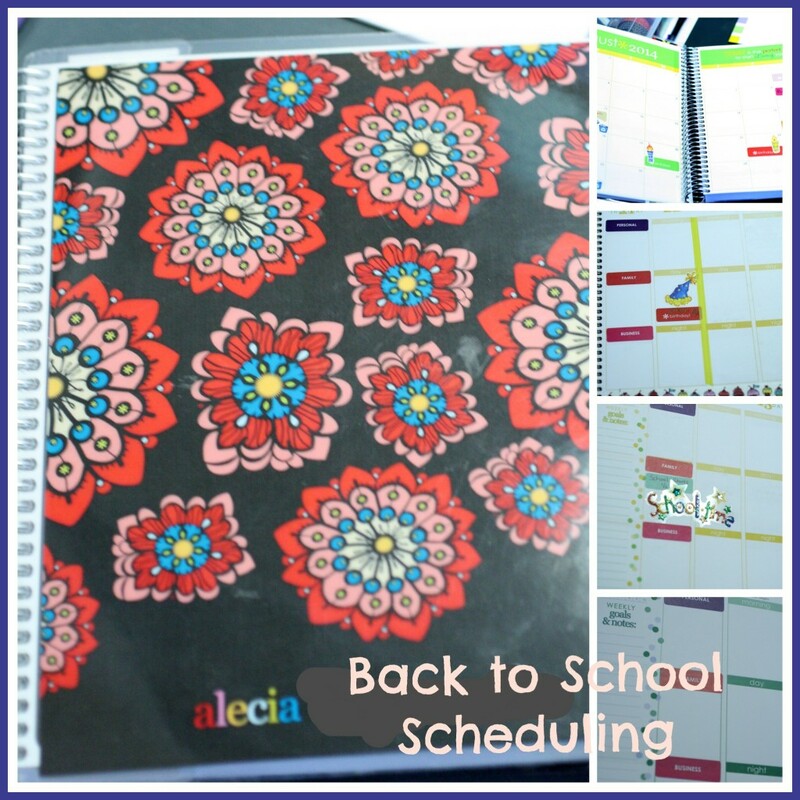 It really has helped to keep our family organized this summer and I have no doubt that it will keep us organized once school starts back and things start to get crazy. Right now, if you sign up through my referral link you will get $10 dollars off your first order. 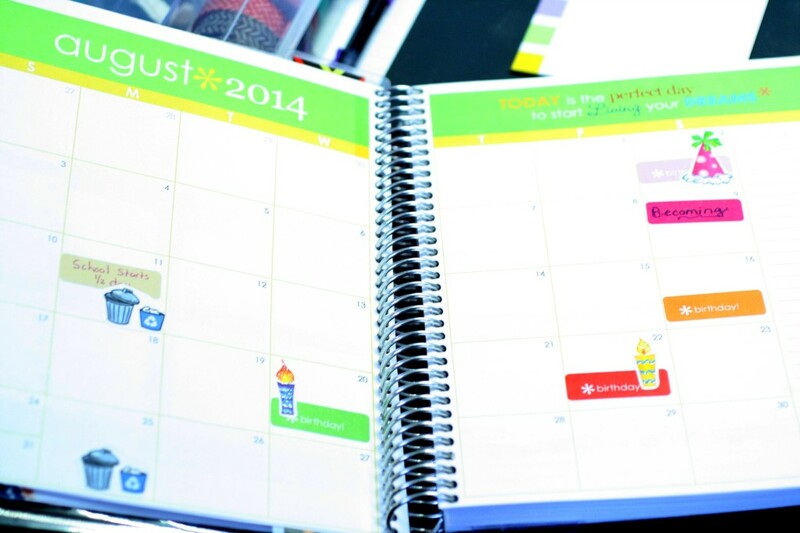 With the recently released new 2014/2015 Life Planners, the customizing options are even better! You can now get removal covers! If you are undecided between two different covers, you can now get both and snap them on and off when you want! I am obsessed with planners and finding the right one. I was doing my own printables similar to the weekly planner pad that I hung up for the family to see. One day maybe I’ll get the EC, it does look like it combines my love of scrapbooking and planning!! Fun, fun.